Harun Ar-Rashid was born in Rayy in 766 and died on March 24, 809, in Thus, Khurasan. Harun Ar-Rashid was the fifth caliph of the Abbasid Caliphate and ruled between AD 786 to 803. His father was Muhammad al-Mahdi, the third caliph and his brother, Musa Al-Hadi was named caliph ketiga.Ibunya Jurasyiyah Khayzuran came from Yemen. 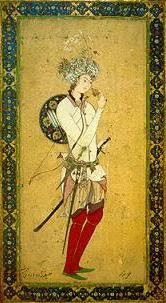 Although originating from the Abbasid dynasty, Harun Ar-Rashid known to be close to family Barmaki from Persia (Iran). In his youth, Aaron learned a lot from Khalid Al-Yahya ibn Barmak. During President Aaron, followed by Ma'mun ar-Rashid, known as the golden age of Islam (The Golden Age of Islam), at which time it became one of the central Baghdad science world. * Achieve safety, peace and welfare. * Build the city of Baghdad with magnificent buildings. * Building a place of worship. * Building a means of education, health, and trade. * Establishing Baitul Hikmah, as an institution that serves as a translator universities, libraries, and research. * Build assemblies Al-Muzakarah, the institute study religious issues were held in homes, mosques, and palaces. Harun al-Rashid is not the Caliph The Love Foya Foya!! Many people believe that the caliphate of Bani 'Abbas, Harun al-Rashid is a man who likes partying and spree-loving, live in gelamour life. But actually, it is not so. Harun al-Rashid is very different from conditions like that at all. He is Abu Ja'far ibn Harun al-Mahdi, Muhammad ibn al-Mansur, one of the caliph Daulah Bani 'Abbasids in Iraq, who was born in 148 H.
He became caliph replace his brother, al-Hadi in the year 170 H. He was the best caliph, and the supreme king of the world at that time. He used to go for Hajj one year and one year at war. Even as a caliph, he still had time to pray that when calculated every day a hundred rak'ahs until he died. He did not leave it unless there is an excuse. Similarly, he used to give alms of his personal fortune every day of 1000 dirhams. He who loves science and knowledge seekers, exalt the honor of Islam and hate sophist in religion and speech against the Qur'aan and Sunnah an-Nabawiyyah. He 179 H berumrah year in the month of Ramadan, and continues in a state of ihram to perform hajj obligation. He is walking distance from Mecca to Arafat desert. He managed to control the city Hiracle and deploy troops in the Roman world to no longer remain a Muslim who was a prisoner in their kingdom. He sent his troops, who then conquered the fort Cicilia, Malconia and Cyprus, and charming population of 16 000 people. Harun al-Rashid died at the age of 45 years or 46 years of war in Khurasan in 193 H.